Just when you thought it couldn’t get any better, they re-invent the wheel! 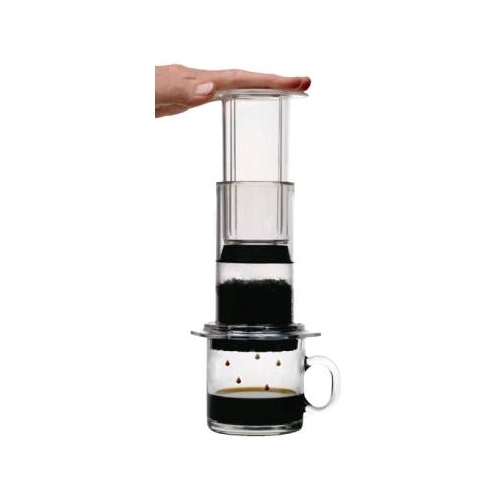 Recently we were introduced to the AeroPress coffee brewer. This little manual unit made, and we are not exaggerating here, THE BEST CUP OF COFFEE we have ever had! It utilizes a very simple concept. The coffee’s flavor is extracted through a combination of espresso-style brewing but happens with a French Press kind of system. The rubber gasket on the bottom of the plunger traps in the steam made from the hot water and when depressed extracts just the good stuff we like in a cup. The result is a fine shot of espresso. We then add more hot water to fill the cup (making an Americano) and voila, perfection in a cup. The extraction time is so short that none of the adverse flavors are captured. And the clean-up is a snap, just twist off the bottom of the brewer and pop out the coffee puck. We never though a cup of Carpe Diem could get any better but we are pleased to announce it can. The unit costs $31.95 (comparable to that of a good French Press).